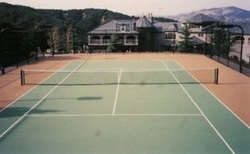 * Johnny's Tennis Courts is now called Johnny's Court Surfacing. * Same owner (John "Johnny" Kolnes) and same great company! Please E-mail or call for more information about our tennis, bocce, basketball and other court services. Service locations include the cities and towns in the following counties of: Marin, Sonoma, Napa, Mendocino, Yolo, Alameda, Contra Costa and other San Francisco Bay Area counties depending upon weather, location and availability. Services include: Tennis, bocce, basketball, mini and outdoor court surfacing, resurfacing, crack filling, repairs, line setting, line painting, court painting, nets, posts, lights, fences, backboards, windscreens and more. Please contact Johnny's Court Surfacing for more information.